How can startups work with large corporations? B2B and B2B2C startups trying to sell into large corporations know this all too well: big companies like to work with other big companies. It often seems like smaller companies lack the secret handshake. If you’re a startup or even a growth stage company trying to sell into large corporation, you lag behind larger players by sheer DNA. You most likely have lost the fight before your product or service is even scored. And if you are based out of country, the cultural gap will kill whatever little chance you might have had. Even if you recruit the best local sales team, large corporations have long deal cycles, that don’t fit expectations of venture capitalists who back most startups. Compliance and regulatory requirements set the threshold well above the Lean Startups MVP. Contracts, legal and procurement departments can easily wear down the startups’ thin armor. Staffing and project management requirements can eat up the few startups’ resources before breakfast. So how can small eDavid like startups sell into and work with the large Goliath Inc. corporations? Most startups create value by unbundling an existing value chain and offering a disruptive value proposition around one aspect of the business. The large corporation is most likely doing what the startup is doing, but as part of a bigger machine. So is the level of their expertise in this specific area. You can be the expert in the field. More than their internal guy on the subject. You probably won’t be able to get their attention using sales tactics, your local large competitors will out dine you… but you can win with insights. By positioning yourself as the expert in the field, and by writing quality content on the subject matter, you can get the big corporate attention via inbound marketing. And if needed you can give it a little push by sharing interesting articles and events on the topic. Remember to express your expertise in terms of the problems you solve not the science or technological beauty of your product. Being an expert is not enough. The area of expertise you unbundle needs to be critical to the large corporation. Assuming you already ‘made your product bed’ and have completed the product-market fit stage, then you need to carefully and creatively choose the corporations. Focus on organizations where your unique expertise holds an enormous opportunity or a tremendous disruptive threat to their business and customers. Work backwards from your unique IP and ask yourself which corporations stand to win or lose the most if and when your disruption catches on widely. Who can lose customers by lagging behind? Who can advance significantly by reducing costs? Your understanding of the big swirls that move even the biggest ships is critical to your success. The answer is not always obvious, sometimes the directly affected players are already deep into their elbows and your expertise is not that much ahead, and the indirect or ripple effect is what you should be looking for. Getting large corporations to turn on a dime is impossible. Yet going into the corporate grind without a clear deadline will consume any startup runway. You need to find a triggering event. Something that takes care of the sense-of-urgency for you. Be humble even about the biggest disruptions. You can’t count on your rhetoric to drive cooperation faster. It needs to be a triggering event beyond your creation. It can be an external shift, tipping point in market trends, competitor’s moves, regulatory change, key customer event, etc. These you can find by being the expert in your field and applying your expertise to the specific corporation you are after. But triggering events can also be internal and unrelated to your area of expertise, such as leadership change, merger / acquisition, board decision, new strategy, strategic customer request, etc. To find such triggers you need to listen carefully during your initial meetings and do some detective work. But it’s worth it. Without a strong trigger, you’ll be grinded into startup dust before you know it. This means different things for different organizations and champions. In my personal experience, in one case the friction was around IP exposure concerns. 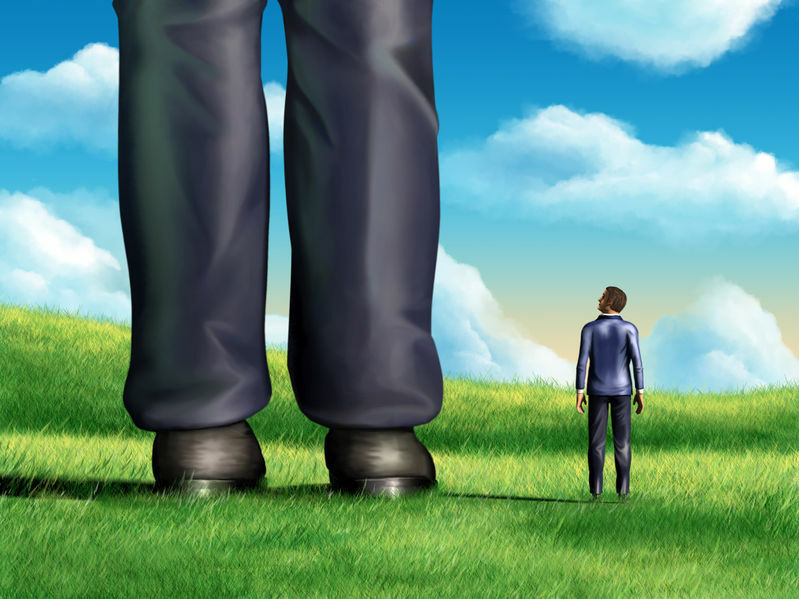 Naturally as an eDavid startup you can’t give legal advice to Goliath, but you can brainstorm and include some creative patent attorneys to help throw some ideas and open the minds of the corporation’s legal team. In another case, I recall friction reduction was helping the organization find and source an implementation partner. It was easier and faster to do that through an external startup than to work through the regular channels. In another case we helped draft the RFP, which is a trust level you want to be very careful about how you handle. In another case this was helping the champion prepare a presentation for senior leadership on the market, trends, threats, selected approach etc. You can see why these are not only friction reducers but actually competitive advantage creators. Large organizations are often slaves to procedures, emails, updates, reports systems memos, you name it. Don’t be another source of those. Try to reduce friction by generating drafts of whatever it is they need about your program. As a startup you may not have a lot of resources but you can generate quality content that can be easily repurposed by your champion. Large corporations like to learn and internalize critical skills. Especially in core or near core activities (which is what you should be doing if you’re following tip #2 above to find the critical path). Beware of learning meetings. You teach they learn… spread your value contribution over time and make sure you achieve progress with each piece you give away. Plan your ‘giveaways’ and your red line. Don’t give it all out in the 1st meeting. I used to have several check boxes for Goliath readiness. The more boxes checked the more expertise shared. You can start off by giving high level overview with plenty of anecdotal examples you can talk about. Specific enough to hint that you know a lot more. Once a champion is appointed, and you assess that he/she has what it takes (see tip #4 above) you can tailor your exposure plan according to his/her needs. Be more generous about educating Goliath on things that are more general knowledge in your field of expertise. Remember that most of your audience is not going to all the conferences you are going to and they don’t read all the professional magazines you read. Yet a small group within the organization could have higher expertise. They may require a different type and level of exposure. Remember you are trading expertise for sale cycle progress, so make sure meetings are scheduled accordingly. If what you bring to the table is valuable there is a good chance that Goliath already has a team working on it or its leadership already has a plan to build one. Either way you are competing with an internal team, whether they know it or not yet… Address the elephant in the room. Think of it like managing a PR crisis. It is always better to lead and control the narrative. You can offer solutions that work for you. Whether it’s a long term relationship with knowledge transfer (if that’s worth it for you at this stage) or shorter term commitment with more of “black box” pieces. You can curve the solution in many ways. Remember both organizations are dynamic entities, you learn along the way and so do they. There is a good chance you’ll be able to learn faster or at least be more agile to translate insights into products faster. So the relationship you offer may vary over time: negotiations, pilot, small roll out etc. You can leverage this to generate motivation to move on to the next phase. I found that often your biggest opposition / competition ends up being your biggest supporter. It is well worth the effort to find them and convert them. Goliath dynamics mean that things can easily get shelfed till next budget year or next campaign regardless of your product quality or sales effort. Many of the efforts above can be easily replicated. Your expertise building is identical across corporations. Even critical paths and triggering events (at least external ones) tend to be identical or very similar across organizations. If you invest in relationships with your champions and the people you come across, you’ll soon discover they move around jobs. Often to similar corporations or business units. They are great door openers and source of information. At one point I was able to close 3 deals with 3 corporations over a period of 6 years, all with one person! Friction points may vary, but over several corporations they tend to repeat themselves. There is no one-size-fits-all but the building blocks are similar. Same goes for pacing your sales cycle and planning the internal competition. Key word is perseverance. This is true for health-tech, fin-tech and other techs. Build your reputation over time. Goliath has an elephant’s memory and most of them respect perseverance. The longer they hear of you, from you and about you, the better position you have. As risk averse organizations, working with startups can be difficult for them to swallow. So the longer you’ve been around the better chances you have to be around going forward… Plan for the long run. This also means setting expectations with investors and stakeholders. Going after Goliath may not be a good idea if you are backed by a VC that’s looking for an out in the next couple of years (not counting on Hale Mary passes). But if you have what it takes, you’ve mastered all 10 points and you’re here for the long run, it can be a great and rewarding ride. It is not an easy thing for eDavid startups to sell and work with Goliath Inc. corporations. But there are certain strategies that startups can follow and actually leverage their DNA advantages. Finding your own interpretation of these tips and implementing them in your own situation is a great place to be in. Good luck! I would like to thank David Schapiro contributing his insights.